This article will give you the rundown on what you need to do to configure your web hosting account to use Google Apps. What is Google Apps? Does it cost any money? Google Apps is a service provided by Google that offers consumers and business a powerful suite of e-mail and collaboration tools. There is both a free and paid version of Google Apps. With this article's assistance, configuring your web hosting account to integrate with your Google Apps is easy! We will only be covering the Google Apps where configuration of your web hosting account is needed. Google Calendar is a web-based calendar application that enables employees to work together efficiently and helps minimize costs and IT hassles. Input the name of a subdomain (ex. 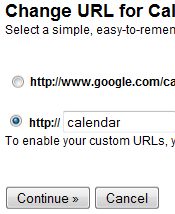 calendar) that you would like to use for Calendar and then select Continue. Go ahead and select I've completed these steps as we will be doing those steps next. Next, login to your web hosting account's cPanel and then navigate to Domains >> Simple DNS Zone Editor. Input the Name of your record, in this example we use "calendar". Input the CNAME of your record, use: "ghs.google.com". Google Docs gives you access to web-based documents, spreadsheets, drawings and presentations that let users edit the same file at the same time so you always have the latest version. Google Docs is securely powered by the web, giving you the flexibility to be productive from your desk, on the road, at home and on your mobile phone, even when you're offline. 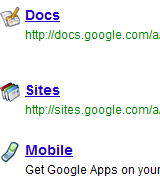 Google Docs works in the browser on PC, Mac, and Linux computers, and supports popular formats such as .doc, .xls, .ppt, and .pdf. Files stored on Google Docs are always accessible and backed-up online. Input the name of a subdomain (ex. docs) that you would like to use for Docs and then select Continue. Input the Name of your record, in this example we use "docs". Google Apps Email is a free service provided by Google and it is a very powerful mail solution. 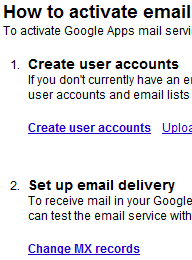 Google Apps Email supports POP3, IMAP and webmail. It is very similar to Gmail, but differences do exist. It is very popular for our users to outsource their email service to Google Apps and we fully support doing so. However, do note that when you use Google Apps for your email, you must use their web interface to configure email, add email addresses, etc. We cannot assist you in the configuration of your email when you are not using our email service. Usernames may contain letters (a-z), numbers (0-9), dashes (-), and periods. Unlike Gmail, Google Apps recognizes dots (.) in your username. bradley and brad.ley are not the same account. To achieve this, ask your administrator to create a nickname for you. Any time you're asked for your username during the configuration process, you'll need to enter your full email address (username@yourdomain.com). The incoming server is still pop.gmail.com, and outgoing server is smtp.gmail.com. To reset your password, you'll need to contact your email administrator. Our users will want to configure both the web URL and the MX record (a must) to fully integrate Google Apps Email into their web hosting. With this article's help, you will be able to get Google Mail activated quickly. Input the name of a subdomain (ex. mail) that you would like to use for Email and then select Continue. Next, login to your web hosting account's cPanel and then navigate to Domains >> Advanced DNS Zone Editor. Click Edit next to the entry for mail.yourdomain.com. Leave the Name of your record as mail.yourdomain.com. Change the CNAME of your record, use: "ghs.google.com". 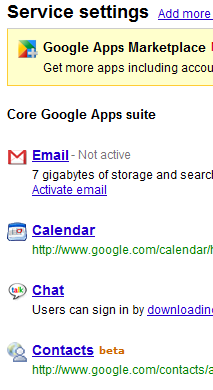 You have now activated your Google Apps Email. Next, login to your web hosting account's cPanel and then navigate to Mail >> MX Entry. Select Edit next to your existing MX Record. Change the Destination of your MX Record, use "ASPMX.L.GOOGLE.COM"
Input the name of a subdomain (ex. sites) that you would like to use for Docs and then select Continue. Input the Name of your record, in this example we use "sites".